Lion tracks found crossing the road. 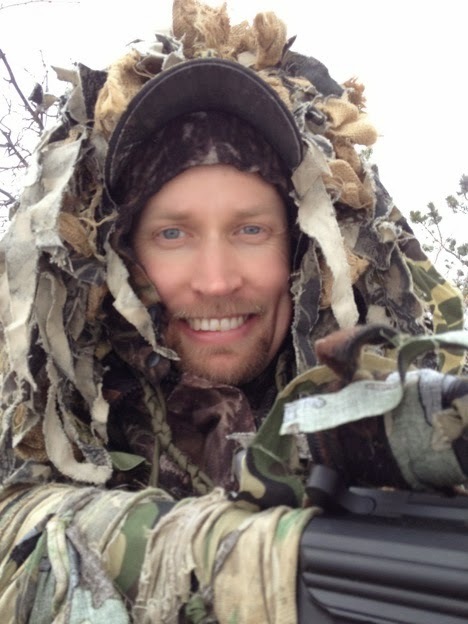 Any lion hunter, whether houndsmen or caller, craves snowfall. 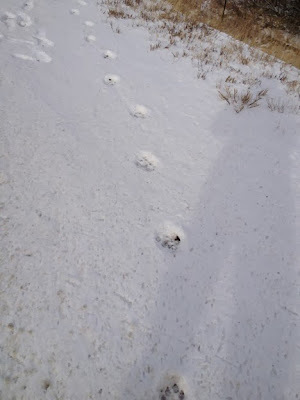 Mountain Lions are such secretive and ranging animals that the best way to locate them is by following a track left in freshly fallen snow. This leads to a caller’s life revolving around weather forecasts and hopes for snow. I have several weather apps on my cell phone and consult each daily during the season. At times the forecasts conflict and I tend to be partial to one predicting precipitation. Another problem I encounter is that my primary lion hunting area is 40 miles away and several thousand feet higher in elevation. The weather patterns can be vastly different despite the relative closeness geographically. Determining how much snow fell and when can be a tricky art from this distance. A kind fellow who lives in one of the areas where I hunt has a live web cam that allows me to have at least an electronic eye on what is occurring. I have passed his home on several occasions, each time vowing to stop one day to say hello and thank you. The “perfect” snowfall in my opinion is one that falls early evening and covers tracks from the previous day. The snow then ceases around midnight and any tracks found at first light are at most, seven hours old. Working the nightshift brings an interesting perspective on Mountain Lion hunting. You get to be awake during the prime snowfall window and can actually see what is happening. When the snow started flying on Thursday and ended around 11:00 pm, I quickly decided that yesterday would be my own personal “snow day”. Once you know what to look for, you can spot a track while driving 40 MPH, it just takes forever to find them; they are the needle in a haystack of tracks. I found myself stating this to my father just a week prior while driving on other snowy roads. I almost missed the needle at 9:30AM on the Friday; oddly enough I was driving about 40 MPH at the time. No other animal walks like a lion in the Colorado mountains, big oval prints in a nearly straight line with a long gait. When I saw this familiar pattern I immediately stopped and bailed out of the truck with high hopes. The Lion had crossed the main paved road while walking down a small creek that fed into a larger drainage. My hopes were crushed when I consulted my map. The land was private, a small sliver of property running for approximately 3 three miles directly beside the course of the road, but only 1/3 of a mile wide. Forest Service land was just beyond that 1/3 mile but I had no way to access it without crossing private land. This is a common problem where I hunt. There are copious amounts of public land, but it is interspersed with private sections, and it can make both navigating and hunting a tedious chore. From the general direction of the lion track, I was fairly certain the lion was on the public land beyond the private. I immediately found the gate to the land owner’s drive. The gate was open but there were a total of three rather large signs proclaiming, “No Trespassing, No Hunting, No Firearms”. On the bottom of another sign was a message that ready, “Do not even think about asking to hunt, Chris. Go away, this means you!,” Ok, so perhaps the last statement was not really there but it might as well have been. I spent the next two hours trying to locate some elusive 4WD roads, which my map represented as access points to the adjacent public lands. I found that these roads were either closed long ago, or non-existent. Giving up on access, I tried one last ditch effort and went to the small mountain convenience store located several miles away. This is the type of store where everyone knows everyone, and serves as both a shopping establishment and a hub of information. After introductions, I learned the private land the lion walked across was actually a Girl Scout camp. My dreams for this lion were dead; there was no way the Girl Scouts of America would allow a lion hunter on their land. I found the clerk of the store to be very receptive of my lion hunter status, and allowed me to leave my contact information should a lion be sighted in the area. She promised to call me if she personally saw one. Her statement was that “she would most likely faint at the sight of one, but would call soon after for certain”. I headed out back onto the roads to check for another lion, hoping for one to cross either public or more receptive private property. During my travels I crossed all manner of tracks, including several bobcat tracks. One bobcat was very large and I had to spend some time deciphering his tracks to confirm he was not a small lion. He intrigued me and I followed him for a length. 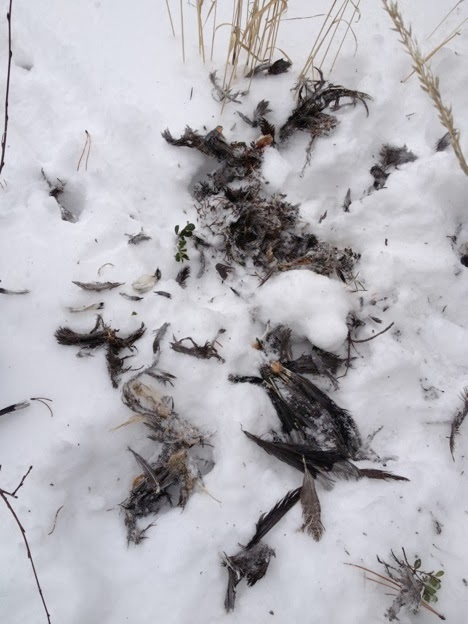 I found a kill he had made on a grouse, and his bed and scratching post. The similarity of how these wild cats behave as compared to their domestic cousins is startling. I also met a band of students from a local community college who were learning about radio tracking collared animals. There professor was a very nice fellow who provided me with the location of a lion track they had discovered a week prior. We exchanged contact information for future discussion about Cougars and he said he would call if he found more tracks. I ended the day hiking onto some public land approximately three miles west of where I had found the lion tracks earlier in the day. 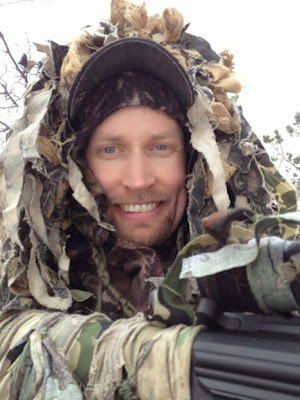 I moved as close to the private land as possible, and to where I thought the lion was headed, and set up a call stand. Ninety minutes of calling produced nothing beyond the routine flock of scavenger birds. With day fading fast I trekked back to where my truck was waiting. The woods were silent and still, beyond the crunch of my feet in the powdery snow. I thought about what I had learned, the people I had met, and the plans for my next outing. While the conditions were perfect for lion hunting, and I was close to following a lion, in a way I was happy that I still had a lion tag in my pocket. The season is still young and I do not want this adventure to be over too quickly.